A ship (top) of the Chinese Coast Guard is seen near a ship of the Vietnam Marine Guard in the South China Sea, about 210 km (130 miles) off shore of Vietnam (May 14, 2014). Time to carefully analyze the Chinese reaction to determine how best to respond in the coming months. One month has passed since the International Tribunal of the Permanent Court of Arbitration (PCA) at The Hague handed down its historic and sweeping award on maritime entitlements in the South China Sea (SCS), overwhelmingly favoring the Philippines over China. As expected, Beijing refused to accept the PCA ruling, hardened its legal and diplomatic positions, and yet refrained from undertaking provocative actions aimed at changing the status quo as many had feared. Instead, it appears that China is biding its time, perhaps until after the G20 Summit scheduled for September in Hangzhou, China. Chinese leaders may have made the rational calculus that because they have already achieved significant gains in the SCS, they must now exercise strategic patience to consolidate those gains. It behooves Beijing to sustain discreet and steady assertiveness to safeguard its strategic interests without overreaching, which could either encourage Washington and its allies and partners in the region to restrain China more or prompt other SCS claimants to take collective action(s). Hence, now is an opportune time to carefully analyze the Chinese reaction to determine how best to respond in the coming months. The ultimate goal is for China to act as (or become) a more responsible global stakeholder and net provider of maritime security that contributes positively to the international system. Otherwise, Beijing’s attempts to execute its SCS agenda and strategic ambitions in the Indo-Asia-Pacific will continue unabated and unchecked. The worst-case outcome for the region, the international community, and the United States, is the emergence of a regional hegemon (and possible future global power), one that disregards the international rule of law and acts without restraint in the foreign policy realm. So far, Beijing has responded with relative restraint with regard to maintaining the regional status quo. China has not declared an air defense identification zone in the SCS, moved to begin reclamation at Scarborough Shoal, blockaded or removed the Philippine tank-landing ship BRP Sierra Madre from the disputed Second Thomas Shoal, sanctioned the Philippines, withdrawn from the United Nations Convention on the Law of the Sea (UNCLOS), or taken additional measures to further militarize its extant outposts in the Spratly Islands. Beijing views its sovereignty over the SCS as unconditional, and the ruling as a major blow to its domestic messaging/foreign policy narratives and national pride (resulting in reputational costs). The result thus could have been much worse for Manila and Washington. Beijing immediately declared the ruling “null and void and having no binding force” and emphatically reiterated that it would not affect China’s extant SCS claims. On the same day, to further emphasize its disregard for the ruling and undermine the legitimacy and authority of the PCA, Beijing flew a Cessna CE-680 civilian aircraft between Mischief and Subi Reefs. Within hours of the ruling, at least 68 national and local government websites in the Philippines were knocked offline in a massive distributed denial of service (DDoS) attack. The crippling DDoS attacks against Filipino government networks continued over several days and targeted key government agencies, to include the Department of Foreign Affairs, the Department of National Defense, and the Central Bank. Additionally, the PCA website abruptly went offline for about five hours following the ruling announcement. Though attribution remains ambiguous for both cyber incidents, circumstantial evidence cautiously points to possible Chinese involvement in the form of state- and/or nonstate-sponsored actors. China’s state censors appeared to suppress hypernationalist calls for increased force, demonstrating its interest in silencing nationalist outbursts. 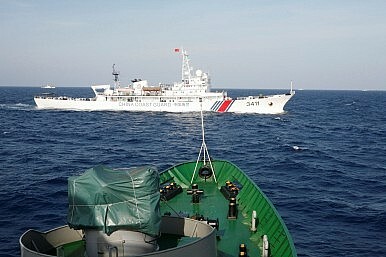 In contrast with Beijing’s reaction to Tokyo’s nationalization of the disputed Senkaku Islands in 2012, this time Beijing did not allow public protests near the Philippine or U.S. embassies. Chinese diplomats and government officials continue to pursue an aggressive regional and global public relations campaign to influence opinion and present Beijing’s legal and political positions as correct through the publication of various comments by sympathetic world leaders, legal scholars, and international relations experts. Most recently, China paid for an egregious three-minute looping video in New York’s Times Square promoting China’s historical role and standing in the SCS to buttress its claims therein. China brokered an agreement with members of the Association of Southeast Asian Nations (ASEAN) to avoid basing people on now-uninhabited islands and reefs in the SCS, as the regional bloc made its first official joint statement on the contested waters since the ruling. The ASEAN joint communique expressed serious concerns over land reclamation and escalatory activities in the area, but did not directly challenge Beijing or mention the ruling. China and ASEAN then released a separate joint statement on implementing the Declaration on the Conduct of Parties in the SCS. Beijing reaffirmed its desire to start bilateral talks on the SCS dispute with the administration of newly-elected Philippine President Rodrigo Duterte, which has shown enthusiasm for direct dialogue with China. Duterte’s unexpected willingness to talk marks a sharp departure from his predecessor. However, while it’s unclear exactly how much maneuvering space exists between Beijing and Manila, China’s diplomatic actions suggest its interest in remaining open to negotiation. During the U.S. chief of naval operations’ visit to China from July 17-20, Admiral Wu Shengli, his Chinese counterpart, lectured him on unwelcome and unhelpful U.S. intervention in the SCS and warned that China is ready to counter any infringement of the country’s perceived rights and any aggressive actions in the SCS. The People’s Liberation Army Navy conducted two naval exercises off the coast of the Paracel Islands in the SCS directly before (July 5-11) and following the ruling (July 19-21). China’s Defense Ministry announced that China and Russia will hold a joint naval drill in the SCS this coming September to enhance their capability to jointly deal with maritime security threats and strengthen the developing China-Russia strategic cooperative partnership. Reverse the International Story. Before and after the ruling, Beijing challenged the Tribunal’s legitimacy and authority and framed China as the true standard-bearer of international law and accepted norms. Beijing, through official statements and authoritative media commentaries, is painting Washington’s position as the minority view while also trying to clarify its maritime claims in the SCS. China’s earlier legal position was more ambiguous. Previously, China stated that it “exerts indisputable sovereignty over the SCS Islands and the adjacent waters and… is entitled to relevant maritime rights and interests based on the SCS Islands as well as historic rights in these waters.” Now, rather than speaking of undefined rights and interests in undefined waters, Beijing has adopted the language of UNCLOS in naming the maritime zones it claims, perhaps leaving room for future negotiations. Moreover, Beijing has been creating new domestic maritime law as part of its continuing effort to reset the terms for international legal disputes it expects to grow as China’s maritime reach expands. China’s Supreme People’s Court recently issued a judicial interpretation specifying standards for convicting and punishing those engaged in illegal fishing or entry into Chinese territorial waters and refusing to obey commands to leave. Use Tensions to Shape Washington… Beijing hopes to exploit Washington’s concern over elevated tensions to check U.S. military operations in the SCS. China proclaims that the nature, scope, and pace of its future moves are tied to U.S. actions, reinforcing familiar Chinese public diplomacy themes: the United States as the destabilizing aggressor; China as the virtuous but hapless victim; and Washington’s arm-twisting of its allies and partners in Manila, Hanoi, and Kuala Lumpur as the source of all regional troubles. ….While Peeling Off Manila. At the same time, Beijing has taken pains to signal that it remains open to bilateral negotiations with Manila. Beijing’s post-ruling restraint is likely paired with economic and diplomatic enticements designed to draw the Philippines closer to China. Beijing’s carefully choreographed and multifaceted response requires an equally well-choreographed and agile response from Washington. Underscore the Tribunal’s Legitimacy Through Words. Washington has no public document articulating its strategic vision for dealing with Beijing’s maritime strategy comprehensively and effectively. An article in a leading U.S. foreign policy publication or perhaps a public speech, by a senior administration official like the secretary of defense or secretary of state, would have a significant influence in shaping China and the region. Underscore the Tribunal’s Legitimacy Through Actions. Beijing seeks to undermine the Tribunal’s legitimacy and authority by drawing red lines around the reclaimed and disputed geographic features. Failing to conduct routine operations in the aftermath of the ruling, particularly freedom of navigation operations, would send the wrong strategic signal and further embolden Beijing. Now is not the time to refrain from principled actions, as refraining would ultimately undercut long-term U.S. strategic interests. Underscore the Tribunal’s Legitimacy Through the Rebalance. Encourage others in the region to use arbitration to resolve their maritime issues. There will be winners and losers, perhaps even including the United States. Yet, Washington must stay focused on the strategic challenge – Beijing – and keep it in check from every direction. Enhance and sustain the rebalance to the Indo-Asia-Pacific, an amalgamation of integrated soft and hard deterrent powers (multilateral diplomacy, economic engagement, and military presence), to reassure allies and partners, demonstrate U.S. resolve and commitment, strengthen U.S. military posture, uphold international norms and rule of law, and, most importantly, guarantee freedom of the seas for all. Help Beijing Save Face. China’s restrained response to the ruling suggests that Chinese leaders want to find ways for both Washington and Beijing to exercise restraint, avoid undermining the bilateral relationship, and pave the way for a possible future accommodation (a grand bargain). Therefore, the United States should moderate its strategic communication and public diplomacy to help Beijing save face with the Chinese people and to a lesser extent its regional neighbors. Otherwise, Beijing will harden its positions and response in order to appear strong and in control to its domestic audience and the region. The strategic window of opportunity to shape and influence Beijing’s future behavior in the SCS may be rapidly closing for the region, the greater international community, and the United States. If China is to become a more responsible global stakeholder and net provider of maritime security that contributes positively to the international system, then Washington must take proactive and sustained actions now. To Beijing, inaction implies tacit consent, and it will continue to execute its agenda in the SCS and strategic ambitions in the Indo-Asia-Pacific unhindered and unchallenged. It is consequently better to reframe the strategic landscape now than to accept a fait accompli later. At stake is nothing less than U.S. preeminence in the Indo-Asia-Pacific. Captain Tuan N. Pham is a career naval officer with extensive operational experience in the Indo-Asia-Pacific. The views expressed are his own and do not reflect the official policy or position of the U.S. Navy, Department of Defense, or U.S. Government.